Often our clients come to us for social media-led PR advice; we did not build ArCompany as a typical marketing or digital agency. Our driving mission is to help companies both structure themselves to be social businesses, and then use social media intelligence to make informed business decisions. That means that we teach them how to gather, understand, and implement the vast amount of information free flowing and customer volunteered through social networks. 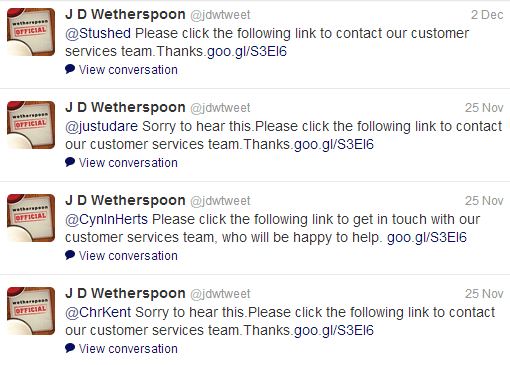 When necessary, we make them nimble enough to communicate their own messages via social channels. We help their organizations adapt their internal structure so that this is all possible. If they take the steps we outline, they’ll be more adept at handling the massive amount of information coming their way via social channels. They’ll also be prepared for the seemingly inevitable social media PR disaster. Very often, our clients want to start the conversation with ‘what do we do when X happens online.’ That is not always the wisest beginning for companies aiming to be better social businesses. but mostly, fear of an enormous PR Disaster. In our Sunday Social Justice posts we’ve covered instances of companies both large and small, caught up in massive viral PR nightmares. Sometimes they are just bad dreams for the company as a whole, but they are always a nightmare for both the marketing and PR Pros responsible for handling them. There is a good reason to be respectful and aware of the damage a PR crisis can do to a brand, but there is also the danger of overestimating what ‘might’ happen and paralyzing your organization from using social media channels to maximize your marketing efforts. Understanding the pitfalls assuages the fear. It can appear that there is danger everywhere. Social Media PR crises run the gamut from small dust-ups, like the American Apparel #Sandy hashtag misuse issue, to massive on and offline PR implosions like the one the Susan G. Komen Foundation is still trying to recover from. The reality is that those conversations are happening with or without your company’s involvement. Training your staff on that issue is one more step in lessening the fear. Like most fears you must contend with in life, planning and clear communication about what might happen and how you will handle it takes the tension down a few notches. Here is an outline of the preparation work your organization should do in advance of a social PR issue. The first piece of advice we give clients is that there is no blueprint for handling a social PR problem adeptly; each situation is unique, and some are far more sensitive than others. We’ve followed brands who engage with nearly every negative tweet and comment online, as well as those organizations that chose to be stoically silent. The right approach for your organization depends very much on what type of crises you are dealing with, your current company structure to handle such crises, and , very often, legal restraints that may effect how you approach complaints. Understanding that there is no one correct answer makes your organization more fluid and nimble, which is often necessary in trying PR times. If your organization is going to be prepared to deal with negative social media, you must be able to honestly discuss all of your company’s past transgressions and current customer service shortcomings, because they will most certainly be pointed out on your social channels. I once dealt with a client who had experienced a murder on their premises; it was the kind of horrific experience no one can plan for. As the years passed, it became a topic that wasn’t spoken about publicly, but you can bet there were whispered conversations ongoing. When we met to discuss social PR Planning, I brought the murder up early in the conversation, and there was an audible gasp in the room. I made it clear to them that there was a very real possibility that it would come up on social channels and they had to prepare for it. Once we got that topic out in the open and had a plan for how it would be handled, they all relaxed considerably. You cannot prepare for every instance but you can prepare for ones you are aware of. This is really an essential part of #2, but it’s requires special attention because it is the number one headache for Community Managers; if you have ongoing and endemic customer service issues they WILL show up in your social media stream because they are surely already out there. It’s not a question of when, because it will be immediate. Customers know that shaming you publicly is the quickest, and sometimes the ONLY, way to get service. If you have serious service issues, you may want to hold off on entering the social media conversation until you get them sorted out or have a plan to do so. And be fully staffed to deal with the complaints that will be coming. You can’t use Social Media effectively as a one way communication channel; if you’re there, you need to be willing to receive as well as publish, and you need to be ready to engage when the PR disaster strikes. You cannot turn off the comments when they don’t suit you – that will only infuriate the complainers. It doesn’t mean you must answer every one of them, but you cannot shut them off. If that is your plan, you may as well shut down your page and go back to print and broadcast advertising. Understanding that social media is a different method of communicating is essential. Your PR crises team is not necessarily the same one that handles your standard social media community; you need a PR Disaster Team with clearly designated roles. Who is in charge when the social media explosion occurs? Who will be manning which channels, and where are their directives coming from? Having some experienced PR Pros on staff OR ON CALL is essential. If you don’t have employees with the proper PR training and skill set, find a consulting company that you have on call prior to the disaster happening. You do not want to be seeking out this most essential partner while under duress. Going back to the first point, there is no blueprint for social media pr issues; every case is different. There are times when non-engagement is the best policy. A couple of weeks ago we covered the Paula Deen crisis and The Food Network’s decision to not renew her contract. We watched as FN’s Facebook Page lit up with angry supporters of the celebrity chef’s, yet they remained silent. Entering into a discussion about race and what is or is not acceptable was a no win situation for the channel, and I believe they did what was required. There are rare instances when the risks of engaging are far too great; a PR professional will be able to advise you on those situations. I once read a great quote by a social pro who said “Plan for spontaneity.” I can’t remember the author, but the statement stuck with me because it is so fitting. Great social media teams are nimble and creative enough to capitalize on real world events to create positive buzz. In social media crises, that ability to spin on a dime is also essential. When silence is not the right option, your lack of reaction can be deafening. Understanding and regularly communicating that spontaneity is a necessary ingredient for handling social pr gets your team ready for just about anything. The reality is that fear is nothing but a great motivator, if your organization chooses to make it one. Nothing listed in this post is rocket science to a well seasoned marketer with extensive social media experience and solid public relations fundamentals. The problem arises when these skill sets are undervalued by an organization until it is too late and they’re in the midst of a crises. Planning ahead of time is what makes these crises as painless as possible. KDillabough What do you think was the worst PR disaster on social media ever? MargieClayman How should brands reach out to their consumers in such a sensitive time during a PR disaster on social media? 12mass There isn’t a one-size fits all answer to that question. A lot of depends on how you’ve prepared, as AmyMccTobin notes. 12mass You want to be honest, you want to remain true to your brand…but each situation is different in the details. Soulati How should brands reach out to their consumers in such a sensitive time during a PR disaster on social media? 12mass That’s loaded Q! Outbound comms, accessibility, transparency, truth, immediate action. AmyMccTobin Good messaging, frequent. Soulati some great points! i would add to that to respond to all of ones mentions! 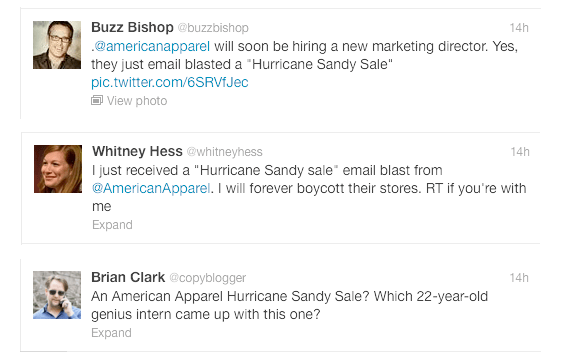 T_Burrows How should brands reach out to their consumers in such a sensitive time during a PR disaster on social media? 12mass I believe they should be humble, apologetic and honest with what happened. No excuses or ‘buts’. Then move on. T_Burrows and measure what’s working and whats not. bowden2bowden What do you think was the worst PR disaster on social media ever? bowden2bowden lol, true. but still brands are just now starting to engage. can i show u a demo on http://t.co/EfcciBpCDJ ? julia_prior How should brands reach out to their consumers in such a sensitive time during a PR disaster on social media? surveyspencer What do you think was the worst PR disaster on social media ever? 12mass proactive, open, honest and via the media that their consumers are using. fjaempeters how about A/B testing responses? 12mass that’s important as well!